It was a friend’s birthday last week and she was having a party to celebrate. It was time to spring into birthday cake action. I’d recently seen a recipe over at Mummy Mishaps for a Blackberry Eton Mess Cake which I thought was a fabulous idea. This was my inspiration, but with strawberries finally coming into season I was going to base mine on the original fruit. I also had some strawberry yogurt that needed using up from the Lactofree event I attended in London and I wanted to get in some of the lilac syrup I’d just made. The cake was a bit of an experiment, loosely based on the rhubarb and orange cake I made a few years ago. I added some crushed meringue to the actual cake, but as I rather strongly suspected, this just melted into the general mix and couldn’t really be detected. Luckily, the cake was a triumph and received many oohs and ahhs before it was wolfed down. The lilac flavour was subtle, but could just about be detected. Next time I attempt this, for there will surely be a next time, I’ll make the Eton Mess and apply it just before eating so that the meringue stays crunchy. 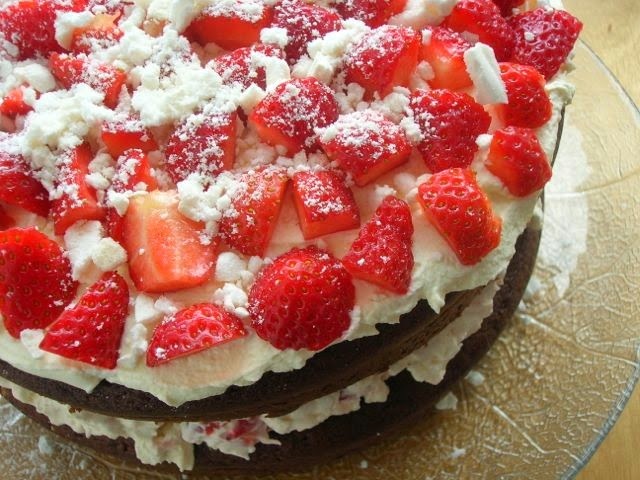 A chocolate layer cake made with strawberry yogurt then sandwiched and topped with Eton Mess and lots of strawberries. Melt the chocolate in a bowl over hot water. Leave to cool slightly. Cream the butter and sugar until light and fluffy, then beat in the chocolate followed by the eggs. Sift in the dry ingredients, then stir gently in alternating with the yogurt and a couple of tbsp of water. Fold in the meringue pieces from two of the nests. Divide the mixture between two 20 cm (8″) round cake moulds and bake at 180℃ for 30 minutes when the cakes should be well risen and a skewer inserted into the centre comes out clean. Leave in the moulds to cool for a few minutes then turn out onto a wire rack to cool completely. Whip the cream with chosen cordial until peaks form. Divide the mixture into two. Put one aside and add half of the strawberries to the other along with a couple of the crushed meringue nests. Sandwich the two cakes with the Eton Mess. Spread the remaining cream over the top, then scatter over the remaining strawberries followed by the remaining crushed meringue pieces. Serve immediately before the meringue has a chance to go soft. Makes one 20 cm (8″) cake. With the floral lilac syrup added to the Eton Mess, I am entering this to Tea Time Treats with Karen of Lavender and Lovage who has chosen floral as this month’s theme. Alternate months are hosted by Janie over at The Hedge Combers. I’m also sending this off to Four Seasons Food over at The Spicy Pear where the theme is the Colour Red this month. It’s normally hosted over at Delicieux or Eat Your Veg. Because this is a great use for the fruit yogurts sitting in our fridge that we don’t normally eat, I’m also sending this off to the No Waste Food Challenge. It’s being hosted by Michelle of Utterly Scrummy Food for Families on behalf of Elizabeth’s Kitchen. The theme for this month’s Love Cake over at JibberJabberUK is vintage. Whilst this may not be a vintage cake exactly, Eton Mess certainly is, so I’m hoping I’ll be allowed to enter. As this was a cake to celebrate a birthday, I’m adding this to a new blogging linky – Celebration Cakes & Bakes over at Mummy Makes Cakes. Recipe of the Week can’t be missed out either, so I’m sending this off to Emily over at A Mummy Too. And finally, I am entering this into the Rix Recipe competition for June where the theme is strawberries. This is a beautiful cake Choclette. You are always so creative with chocolate and I love chocolate with strawberries.. it is difficult not to love them though. They are so juicy and tasty right now. I keep buy strawberries twice a week and organic ones are particularly good! Thank you Alida. Now is definitely the best time for strawberries – it’s almost worth waiting a whole year for them. Thank you Manu, you are always very kind. oh my good lord this is a stellar cake… what an amazing idea. 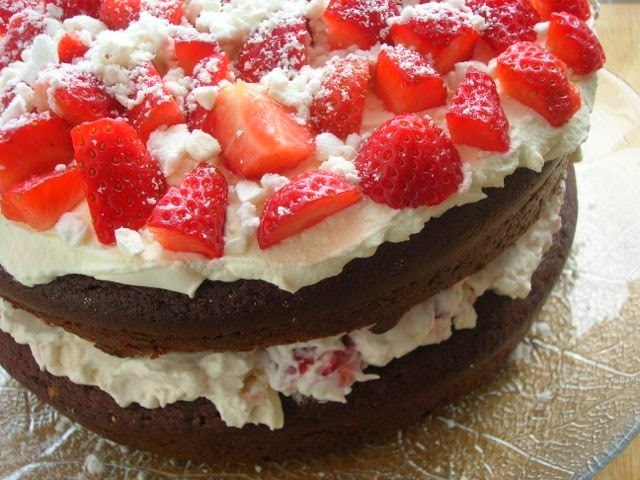 I much prefer my chocolate cakes with a fruit filling as I think it cuts so nicely through the chocolate but had never thought of an Eton Mess cake… bloody marvellous!… and the yoghurt is a fab idea too! “Chocolate Log Blog” has been included in my Arlynda Lea’s Sites to See #3. I hope this helps to call more attention to your efforts. Thank you Arlynda, that’s very kind. sounds lovely choclette. I’d have to replace any strawberries with raspberries, but that might not do any harm! Raspberries might even be better Fi. I am definitely making this!!! It looks and sounds delicious, and my mums birthday is coming up too! Thanks Amy, I know I’d be very happy to get this as a birthday cake. Ooh, aah, yesss that’s a wonderful cake. It’s really wonderful strawberries are in season now. That’s exactly the cake to enjoy right now. Thank you Denise. Would love to hear how you get on. Ooh I’m on the fence with that one CC. When I have strawberries they are my favourite and if it’s raspberries then I’m delighted too. Now why didn’t I think of this last month Ros – doh! This sounds divine! I love meringue but never thought of putting it in a cake – will definitely be trying it! Thanks Hayley. The trick is to add the meringue at the last minute or otherwise it just melts away and you don’t get the crunch. Gorgeous and a nice lot of events entered! Thanks Helen. I fear this cake may become a summer regular. Most certainly a vintage cake for me! A delicious combination of chocolate and seasonal strawberries plus the meringue twist to it. Phew, glad that was OK Ness. It was a very scrummy cake. Thanks Michelle, it makes a good twist as a filling or topping OR both. Now that just looks like my idea of heaven in a cake!